Damien High School freshmen Chazzman Chung and Brian Kim had a great time at Ice Palace learning about Newton's laws of motion. 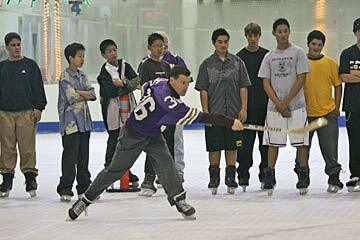 Dave Watson, Damien Memorial School science teacher and former pro hockey player, took his ninth-graders ice-skating last week to teach them Newton's laws of motion. 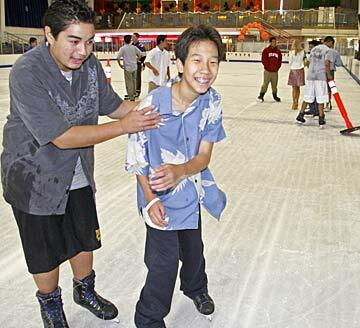 Many had never skated and one had never seen an ice rink until they got to the Ice Palace. But discussing the unique experience back at school, all of them understood Newton's laws, he said. Watson, 29, was a forward for the Amarillo Rattlers of the old Western Pro Hockey League until he was injured and released from the team. This is his first year at Damien and his fourth year of teaching. Watson said he couldn't think of a better classroom to teach Newton's laws of motion than the ice rink. "I'm thinking of using the water park, too," Watson said, explaining he likes to combine traditional and inquiry-based learning. Dave Watson, Damien Memorial School science teacher, took his students to the Ice Palace to teach them Newtonian physics. Falls were inevitable Tuesday for the first-time skaters. "But, well, that's gravity," said ninth-grader Jaryn Lunasco. Watson said his class on ice was a big success -- the students learned a lot about physics. And some "even inquired about playing youth hockey at the Ice Palace." » How an object set in motion remains in motion until acted on. He fired a slap shot from the middle of the ice to the boards, where it stopped. That is one test, he said. "A student pushing another student on skates is another way to test this out." » The acceleration of an object depends on the mass of the object and net force acting upon it. Students used their own force to push students of different sizes to test how the acceleration changed. » Every action has an equal and opposite reaction. Facing each other on skates, the students pushed each other, learning that both moved backward. They also learned that forces result from interactions between matter, Watson said. A figure skater helped Watson show students how momentum is wasted by spinning with arms extended and how momentum is conserved with the arms in. He said this illustrated Newton's ideas about conservation of momentum, angular momentum and centripetal force. The students were required to write essays about Newton's three laws based on the experiments. "When you have a positive experience like that, the kids can attach what they learned in class," Watson said. "It's a good jumping-off point for them in college when they have to learn Newton's laws." Brother Greg O'Donnell, 66, Damien Memorial School president who did a lot of skating as a youth in Chicago, also took to the ice to see if he could get his balance again. Observers said he did fine. Ice Palace owner Doug Taylor donated an hour of ice time to Damien to support the science class project.